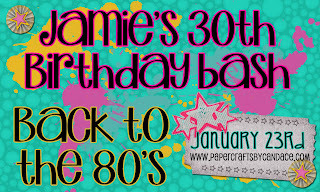 We are totally doing a Back to the 80's Themed Blog Hop for our DT Sister Jamie of Jamiek711 Designs. It's her Birthday Today! Happy 30th Birthday! If you jammed over here from Michelle's Blog, then your in the right place. I really hope your enjoying everyone's creations so far. Like, don't you totally love my little Smurfette? on a free coloring book website. and like, tweaked it a little bit and cut her out. was a total head rush and not grody to the max? Strawberry Cupcake and Grape Fiz! 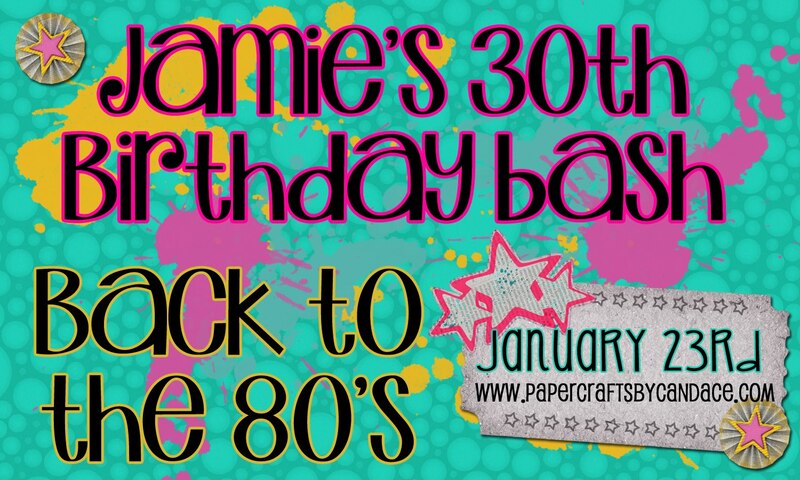 OK...time to book over to the totally awesome Abby's blog Don't be lame, be sure to stop by and wish Jamie a very Happy Birthday! smurfs...! so cute thanks for sharing!! love love love the smurfs this is so cute! I loved the Smurfs. This is just too darned cute. This is so cute! I love that candy in tubes and the flair is so awesome! Thanks for being a part of this hop for me!!!! 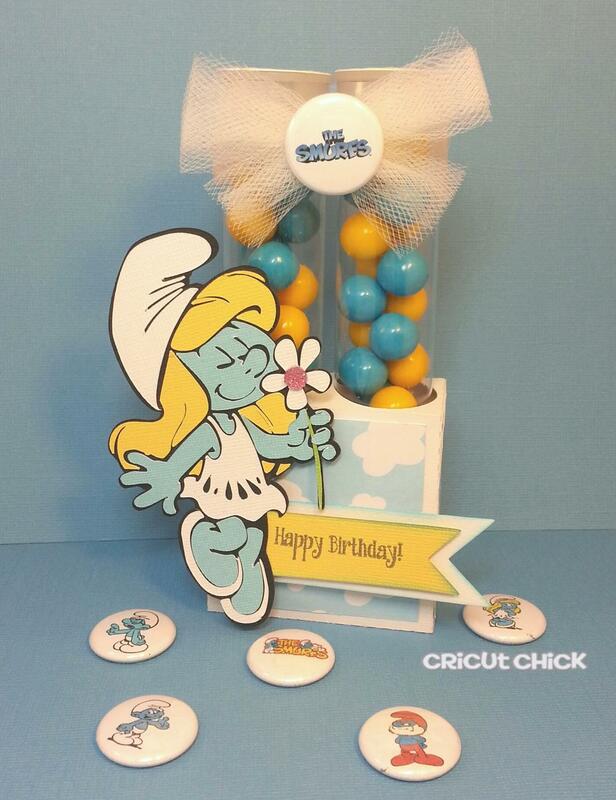 WHAT'S not to like...so adorable...she is one cute smurfette indeed...love it...Great Job !! 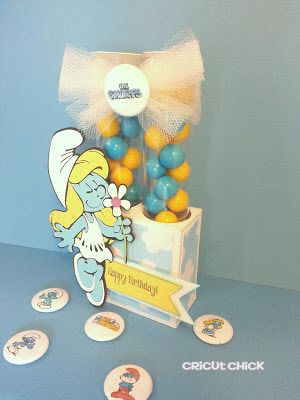 I love Smurfette :) Love the colors you chose - very nice project!! Awwww, sweet little smurfette! My girls watched that cartoon all the time! You totally did an awesome job on your project fer shur! Oh my gosh! This is the cutest!!!!! I loved the smurfs!!!! This is so stinkin' cute!!!! Smurfette is the bomb! :) Love that you matched the candies to her colors too. So fun!! Supercute and love your blog wording! another awesome project!!! 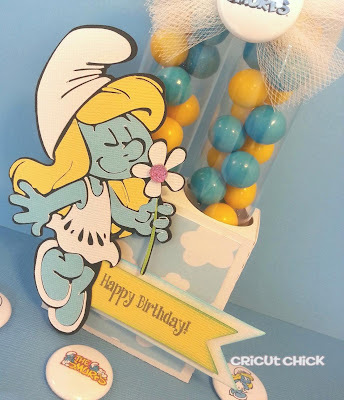 I LOVE Smurfette and your treat containers are adorable!!! This is SMURFY! I love it! So cute Julie!! Awww, I love Smurfette! Happy Birthday Jamie! I loved the Smurfs! This is such a cute candy holder. TFS! Love the smurfs and I love your project. that is totally awesome!! Happy Bday Jamie. Oh I love her!!!! This is so cute! I just love Smurfette! So stinkin cute! I like, totally love Smurfette! She's like, so awesome! Oh my gosh! I was CRACKING UP reading your post!!! LOL! That Smurfette is BEYOND AMAZING!!! Great job!!! this is sooo stinkin CUTE !!!! I loved the smurfs when I was little ~ mmm maybe because we only got 1 channel growing up and I was limited on what I could watch LOL !!!! No help needed with the lingo...I'm an 80's dudette like Totally!!! hehehe...your post had me like in a fit of giggles... Too funny! ;) But your smurfette project...LOVE LOVE LOVE!!! Wonderful job!!! Adorable!!! How awesome is this!!! Fab project, TFS Julie!!!! and HAPPY BIRTHDAY TO JAMIE! love this!!! best 80s hop ever! !